Vietnam and France are marking 50 years since the defeat of French troops at the battle of Dien Bien Phu, leading to the end of French rule in Indochina. French President Jacques Chirac paid tribute to the fallen at a ceremony for French war veterans in Paris. Vietnam is celebrating its 1954 victory with ceremonies for war veterans in Dien Bien Phu and across the country. The battle lasted two months and left 12,000 dead before Vietnamese forces overran the last French positions. 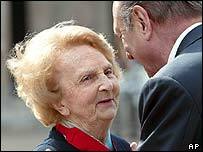 On Friday Mr Chirac led a ceremony at Les Invalides former military hospital in Paris where he decorated 19 people, including Genevieve de Galard, 79, a nurse who was trapped with the French army during the 56-day siege by Vietnamese forces. Speaking of the battle, he said: "In the many pages of glory and trauma which figure in our history, Dien Bien Phu occupies a special place. "Without sleep, short of munitions, bandages, food - they fought with all their strength and extraordinary courage, with the energy of despair for the honour of arms and the honour of France." He added: "Today the name of Dien Bien Phu has become the very symbol of military honour defended to the extreme limit of human force." In Vietnam, around 15,000 people crowded Dien Bien Phu's main stadium to watch military parades, variety shows and listen to speeches on Friday. Defence Minister Pham Van Tra told the crowd: "We are sharing the joy and victory with the people of France and the peace-loving people of the world." Two French embassy officials will lay a wreath at the French monument in Dien Bien Phu, a white obelisk on the former location of the French military hospital. The BBC's Allan Little, in Paris, said that in 1953 the French had strengthened their defences in what was then the French colony of Indochina. 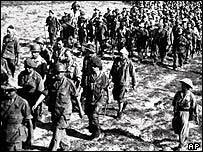 But the Viet Minh launched an attack in March 1954 whose ferocity took the French by surprise. In the weeks that followed the French attempted several counter-offensives, but were overrun. More than 2,000 of the 20,000 strong French garrison were killed. After the French agreed to peace negotiations, Vietnam was partitioned into a Communist North and a South backed by the western powers. Our correspondent says Dien Bien Phu therefore paved the way for the American war in Vietnam in the following decade. Dien Bien Phu was a mortal blow to France's aspiration to remain a global power. It also marked the beginning of the end of France's colonial enterprise.